One of the main reasons liberal democracy appears to be imploding is that the liberal international capitalist order on which it has been based for the last seventy years is imploding. 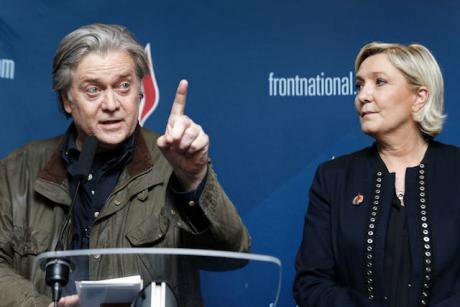 France's Front National president Marine Le Pen and former US President advisor Steve Bannon at the FN annual congress. March, 2018, Lille. Sylvian Lefevre/Press Association. All rights reserved. The decade that has elapsed since the financial crash in 2008 has not been an easy one for progressive politics. As contributors to this series have pointed out, the fortunes of liberal centrist politics have collapsed in many western democracies, and new illiberal democracies and authoritarian regimes are on the rise across the world. Since the end of the cold war the number of democracies has been steadily rising according to the Economist Intelligence Unit index, but in recent years it has rapidly gone into reverse. Only 19 states still qualified as full liberal democracies in 2017. Both the United States and France were classed in the flawed democracy category. After the high hopes at the beginning of the 1990s of a new era of democratic advance following the collapse of the Soviet Union and the end of apartheid we have entered a period of democratic retreat. What is especially alarming, as Edmund Fawcett makes plain, is not just the declining fortunes of democracy and fears about the stability of the ones we have in the face of the severe challenges they face, but also the growing support for new parties and movements of the hard right. They see themselves as insurgents against the established order, and are explicitly against liberalism, against the rule of law, against the rules based multilateral international order, and against science and objectivity. Many questions which were thought to have been settled have been reopened. There is a lot of dispute about what the new insurgent movements should be called. Fawcett is right that these are not Fascist parties, although they share some of the same roots. They are a strange coalition as he puts it of economic libertarians and socially conservative nativists. The term that best captures them is populist nationalists. They are primarily nationalists, seeking to take back control of their countries with slogans like America First, reversing decades as they see it of decline and humiliation. They are against multilateralism of all kinds and want to tear down the institutions of the liberal world order and reverse the trend towards ever greater interdependence. They are part of a wider anti-globalisation movement. They also use the rhetoric of populism, pitching the people against the elites, claiming that only they represent the people against the remote liberal cosmopolitan elites, which includes all the mainstream parties of the Centre Right and the Centre Left which have governed western democracies for the last seventy years. Fawcett is right to note that this populism is a style of political self-justification. The leaders of these new movements are an elite contesting established elites. The leaders of these new movements are an elite contesting established elites. They are now a presence in almost every established western democracy, and their recent successes include the election of Trump, the Brexit vote in the UK and the formation of a government in Italy between the Five Star Movement and the League. Who is responsible for the global rise of this new hard right insurgency? Much attention has been focused in contributions on this site on the failure of progressive politics. Michael Sandel has argued that Trump tapped a well-spring of anxieties, frustrations and legitimate grievances to which the mainstream parties had no compelling answers. The Centre-Left embraced a technocratic liberalism which did not challenge the assumptions of the reshaped international market order which emerged from the battles of the 1970s and 1980s, and which led to a sharp rise in inequality and the internal fracturing of societies into winners and losers from globalisation. Francesco Ronchi thinks that what we face is not primarily an attack on liberal democracy from without but the implosion of liberal democracy from within. Liberals have been so entranced by technocratic administration that they readily embraced the depoliticization and marketisation of huge swathes of public policy. Democracy was hollowed out and progressives forgot how to articulate a vision of community. Jon Cruddas speaks of a loss of ethical grip, and Michael Sandel of the unwillingness of liberals to engage in substantive moral argument. All these criticisms have some validity but we need to remember the wider context. Many of these hard right insurgencies, although not all, were active in the early 2000s and the 1990s. What has given them such traction is the events which followed the financial crash in 2008. The puncturing of the boom ushered in a period without parallel in the western capitalist economy since 1945. The failure of the economy to bounce back as it had done after every earlier recession meant a period of very slow recovery and grinding austerity, accompanied by exceptional policy interventions, including quantitative easing and zero interest rates to preserve liquidity and prevent a meltdown. In 2018 the western economies showed some signs at last of a real recovery, but there have been warnings from many quarters that with a continuing savings glut, huge imbalances, high levels of unsecured debt, and continuing reckless behaviour in the financial markets, the possibilities of another major financial crisis and global depression are very real. There could be any number of triggers for it, including the growing risk of an all-out trade war between the US and China. One of the main reasons liberal democracy appears to be imploding is that the liberal international capitalist order on which it has been based for the last seventy years is imploding. No parties of the liberal centre, whether Centre-Left or Centre-Right have yet developed policies which can resist the storm which is engulfing them. These parties were once so good at delivering prosperity and security. Their failure to do so in the last ten years has created the opportunity for the new insurgencies, both of the right and of the left. Another major financial crisis would be devastating for the stability of many liberal democracies. The new hard right international which Steve Bannon and his associates are seeking to organise is well aware of this. It thrives on chaos and collapse. How can any of this be countered? We certainly need a new moral vision and a new readiness to engage in moral argument and political persuasion. But we also need a new political economy, and most important of all we need to find a new way of doing politics, we need to build an Open Left. Such a project can be advanced by many different political parties and movements – liberal, green, social democratic and socialist. We need to abandon the idea that one tradition of progressive thought has all the answers. We need to abandon the idea that one tradition of progressive thought has all the answers. We need openness to new policy ideas and openness to learning from past mistakes and the experience of others. We should be prepared to listen to very different voices and draw from very different intellectual traditions, engaging with people from a wide range of communities and backgrounds and from many different countries learning from their experience in putting progressive ideas into action. We need to reject false polarisations between economic nationalists and economic globalists, nativists and cosmopolitans. We can be citizens of the world and at the same time citizens of particular nations, cities and communities. We have to be concerned with issues of place and identity as well as international cooperation and global networks, and that means giving greater priority to relationships and to communities, families and households than to the profit and loss calculations of faceless state and corporate bureaucracies. We live in complex post-industrial economies and multicultural societies. Many old certainties and landmarks have disappeared and are doing so at an increasing pace. We have to live with deep divides in opinion, interests, and knowledge. There are many values and perspectives and no single right way. But there are also certain principles which any progressive politics must uphold. Edmund Fawcett puts it well when he says that after 1945 a frame of politics was established in which the gap between avowed aims and actual achievements became measurable, discussable in practical terms and to a degree closeable. It is that frame which the insurgents most want to tear down. There are also clear policy priorities for an Open Left. The first is an open multilateral international order. The current one is broken, and what replaces it must go beyond the western-centric order of the past and fully involve the rising powers in Asia, Africa and South America in determining the rules which should govern this order. If we fail to maintain multilateral institutions, imperfect although all of them are, we risk a return to economic nationalism and military adventurism. The second priority is an inclusive and sustainable economy. We have to abandon the pursuit of economic growth at any cost and the maximisation of shareholder value. Instead we need a political economy which safeguards the biosphere and maximises value for all stakeholders, particularly domestic households and local economies. We cannot do any of this without strengthening state capacities to make possible a more decentralised, egalitarian and sharing economy. The third priority is a remodelled welfare state, based on policies that can provide both security and autonomy for all citizens,so that no citizen is left behind, reviving and reformulating the idea of democratic citizenship that lay at the heart of the universal welfare states which were one of the great progressive achievements of the last century. There are many creative ideas for doing this. The quest for equal citizenship targeting the many forms of discrimination, disadvantage and abuse remains a central progressive aim. The fourth priority is a renewed democracy. Much has been achieved in the last hundred years since women won the vote, but much remains to be done. The quest for equal citizenship targeting the many forms of discrimination, disadvantage and abuse remains a central progressive aim. We also need to find ways to decentralise power to get real local accountability and participation, and to be constantly vigilant about the many threats, some old some new, to the rule of law, media plurality, freedom of association and freedom of speech. Liberals and progressives have to recover their voice and their moral compass. It carries risks, as Benjamin Tallis observes about Emmanuel Macron and his offensive liberalism. That is because democracy carries risks. But we no longer live in a time when technocracy suffices. There has to be a new politics of passion and commitment and belief, and there is no guarantee of success. But to refuse to engage in the debate and the struggle against the hard right would be a guarantee of failure. One key task is to develop the kind of policies which make sense to citizens in their everyday lives. Progressives have huge resources on which to draw, but they need to rediscover the energy that comes from a politics from below. They need to become insurgents too. Anthony Barnett is right to say that the old order is broken and cannot just be patched up. We do not all have to unite under the same banner, but we do need to co-operate and to learn from one another. An Open Left is not an impossible dream. It is something we urgently need to combat the dangers we face.